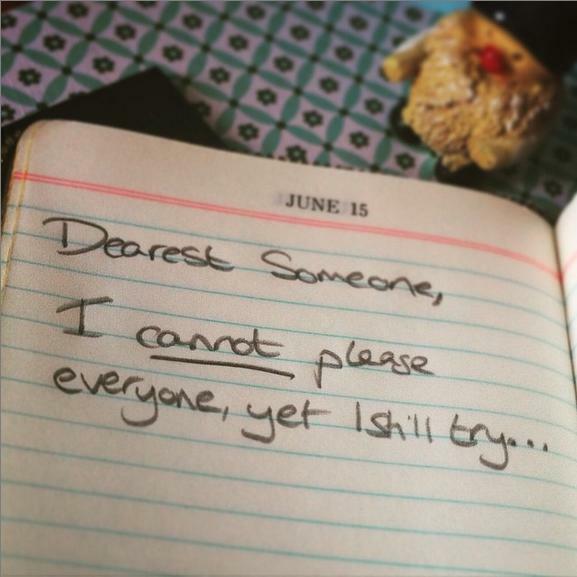 One thing I’ve learnt, yet frequently have to remind myself is the blindingly obvious fact that I cannot please everyone. Heck most of the time I’m hating on myself, so why do I spend a lot of energy trying to please people who, at times, do not even notice my efforts? For me personally I work in an environment where I’m constantly meeting new people, I have to represent certain institutions as well as myself – fortunately I’ve always tried to please people; maybe at times often trying a little too hard. I don’t have a hard time saying no, I know perfectly well how to say no when needs be and I don’t have people pressuring me to work hard and do things – yet I seem to be constantly plodding along at full speed. The pressure I put on myself to please everyone is pretty intense. I could be all guru-listic here and say that maybe this pressure stems from past experiences – having to rely on people to save me from some pretty surreal situations, and people just being pretty downright awful. Yet I know full well that it’s impossible to please everyone – so I need to find a way to ensure that I look after myself! I’m not suggesting we all run around like a bunch of headless chickens (I love that phrase), I’m not suggesting we start insulting every poor soul we come across – I’m just saying that at times it’s important to remind ourselves that there will be times when we cannot do what we are asked. There will be times that people do ask us to things that we simply cannot do, that we do not have the skill (or time) to do, and that we do not feel comfortable with – and we must remember that it is okay to say no. I have a pretty long list of things that I need to do, and I’ve already agreed to do them so I am going to try my best to complete them. Yet, I’ve found lately that I simply haven’t been able to do things – fortunately those whom I work with are very understanding. However, recently I’ve been working with a different team within one of my roles and there have been some pretty intense deadlines – the work they are expecting from me constantly changes (which is fine) however that mixed with my Masters degree has left me pretty swamped with work. I’ve had my medication changed this past week, met with two mental health advisers, my GP, and a new doctor at my CMHT, as well as having my wisdom tooth removed – yet I’m still running around like a rocket as I feel I don’t know this new ‘boss’ well enough to tell them my situation. It’s meant I’ve had to force myself to go to meetings and do work when I’ve really not felt right – which thankfully hasn’t affected my work, but it has left me pretty exhausted. I need to find a balance, and I’m working on that… but it’s strange how uncomfortable I feel disclosing information about my health (PTSD) to some individuals, despite how openly I blog about it! Next Where’s sleep on your to-do list? !